The partnership between Fox News and the Republican National Committee (RNC) makes sense. No one was surprised to hear that the right-leaning news outlet paired with GOP candidates for an event that, let's face it, serves mainly to make Republicans look good. However, the entrenched union means that many issues will likely be ignored or skimmed over during Thursday's first Republican presidential debate. These debates are like T-ball. You don't need skill to play; just a broad understanding of how the game works. 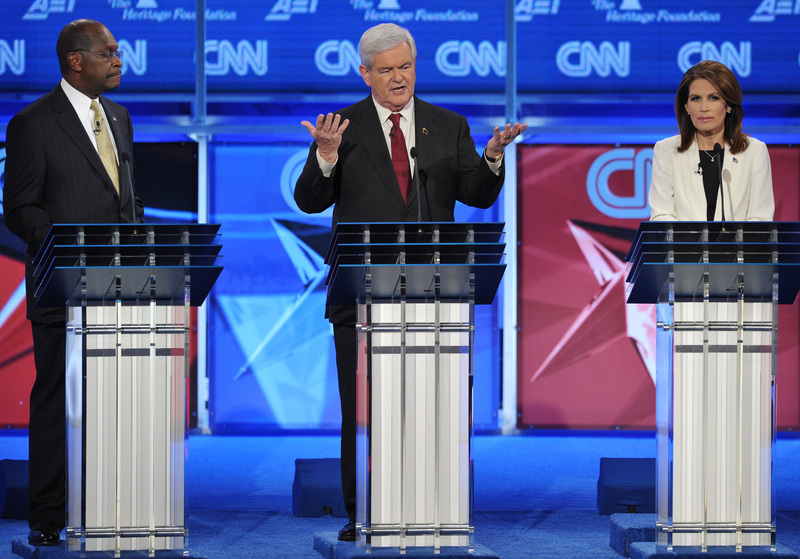 In the June 13, 2011 Republican debates, some of the questions asked to the people who desperately wanted to be president were: Dancing with the Stars or American Idol? BlackBerry or iPhone? Elvis or Johnny Cash? Leno or Conan? And that was with CNN hosting, not the network associated with boosting the image of GOP candidates. This year, I am not expecting Fox News to get to the heart of the matters on the mind of most Americans at this moment. I am expecting a personality quiz and many opportunities for candidates to take jabs at Planned Parenthood and Hillary Clinton's emails. I would give up my car to be able to ask, "Candidates, many of you have attempted to halt legislation that would fight the pay gap, human trafficking, a lack of women's healthcare, and sexual assault in the military. Can you explain why women should vote for you, when you insist on making their lives as difficult as possible?" Handling ISIS is an issue that divides many Republicans. Therefore, candidates aren't being specific about it, in order to avoid offending anyone. If ISIS comes up at all during the debate, it won't be a call for details. It will be an opportunity for candidates to say something about loving America and wanting to protect it. Oh, Planned Parenthood will definitely come up. I could probably invent a drinking game in which you take a shot every time someone bashes the nonprofit. But no one's going to be asking, "Candidates, you condemned Planned Parenthood because of a highly-edited video. Are you so self-involved that you didn't believe you could be wrong, or did you knowingly lie to your audiences?" No one asking the questions on Thursday will go anywhere near racial issues and the failing criminal justice system. That just gives the candidates the chance to embarrass themselves and provoke more protests. Of course Fox News will have to devote some time to the economy, though viewers won't like it as much as fiery topics such as immigration and health care. But they'll be satisfied with positive, can-do answers about "working hard," and we'll have to hear, "Let's get to work," about a thousand times. Candidates will say something about Democrats who love Wall Street and big business, knowing what a big burst of applause they'll get. In a real debate — you know, like the ones high school students conduct — the minimum wage would be a serious topic to bring up. There would be thoughtful back-and-worth about the benefits for low-income families versus the potential loss of jobs. This is not that debate. The debate might include some punches toward the Supreme Court decision on gay marriage, but I would bet my life that no one is going to talk about the many ways members of the LGBTQ community are still discriminated against. Maybe, just maybe candidates wouldn't make ignorant comments if they knew they would have to answer for them. As a voter, I genuinely want to know what reasoning Donald Trump and Mike Huckabee have for making the ethnically-charged claims that they do. I want to know what the candidates think of all these issues. Unfortunately, no one's going to ask them.